Petrosains DinoTrek2 exhibition giving the Interactive Dinosaur Experience to everyone who interested in dinosaurs. It is part of the permanent Petrosains PlaySmart Science Centre Kuching, brought to you by Petronas in Sarawak. T-Rex sculpture on the ceiling. the permanent Petrosains PlaySmart Science Centre is expected to be ready by the end of 2019. Recommended visiting time is about 30 minutes. Admission ticket is based on First-Come-First-Serve basis. Children under 12 years old must be accompanied by a parent or guardian at all time. Dinosaur head sculpture on the pillars. Looking through the jaws of a T-Rex. The entrance to the DinoTrek 2 exhibition. DinoTrek was first open to the public in the year 2002 in KLCC before venturing out and starting its traveling dinosaur exhibition since year 2004. DinoTrek had travel many places in Malaysia, including Sabah, Kedah, Johor, Terengganu, Pahang and Penang. 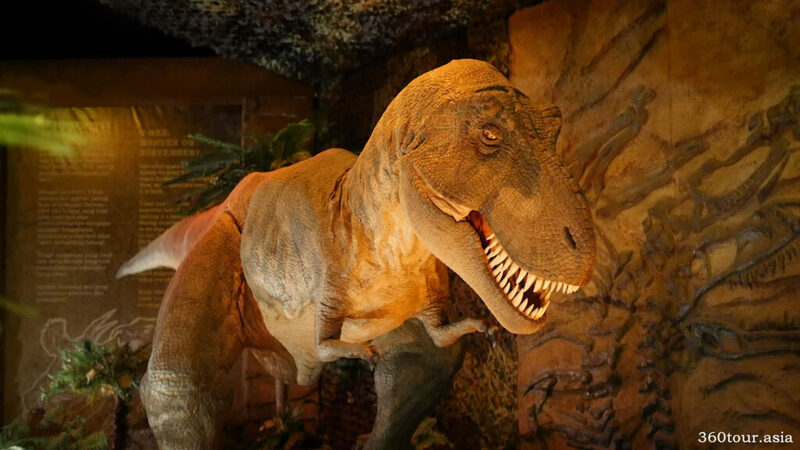 It features nine animatronic dinosaurs, 12 interactive exhibits and hands-on interactive activities. It was plan to finally set foot in Kuching Sarawak, with the permanent Petrosains PlaySmart Science Centre be the permanent home for DinoTrek. The historical timeline of dinosaurs. The exhibition hall is filled with visitors. Dino Dig – kids love to brush sand off the dinosaur fossils. what’s inside a dinosaur animatronics ? an exposed dinosaur animatronics reveal the details in its motors that responsible for the dinosaur movements. The skull bone of a T-Rex. Don’t forget to take some photos of the T-Rex skull bone here. Maiasaurus protecting its young nestlings. Apatosaurus, which means “deceptive lizard”, is a huge herbivorous dinosaur that lived during the Jurassic Period. Tyrannosaurus Rex, or “tyrant lizard”, is one of the largest carnivores ever to live on Earth. Its powerful jaw muscles gives it the strongest bite force of any land animal, living or extinct. Tyrannosaurus Rex which is famously known as T-Rex. The description of Tyrannosaurus Rex. Spinosaurus, or “spine lizard”, is believed to be the largest carnivorous dinosaur ever. It is a huge fish-eating dinosaur with a series of spines on its back forming a sail-like fin. Most scientist think its tall backbone are for mating or warning display, though some think it’s a hump for storing fat. Stegosaurus, which means “roof lizard”, is one of the most recognizable dinosaurs due to distinctive plates on its back and tail spikes. Considering its size, Stegosaurus has the smallest braincase among the dinosaurs. It can only fit a brain the size of a walnut. The Velociraptor, which means “swift robber”, seen in movies and theme parks are actually modeled after its bigger cousin, Deinonychus. The real Velociraptor is a turkey-sized, agile and feathered dinosaur in a family closely related to modern birds. Despite having feathers, Velociraptors could not fly or even glide. Protoceratops, which means “first horned face”, is a sheep-sized dinosaur with a proportionately large skull. Large single-species bone beds suggest it was probably a herding animal living in the sandy Mongolian desert of late Cretaceous. Do bring your family and friends here and have a education tour at the dinosaur exhibition at DinoTrek 2 Kuching. We are looking forward for the launching of the permanent Petrosains PlaySmart Science Centre in 2019.